Oh dear! My optimism was premature. I’ve been feeling perfectly rotten again over the last few days. Forgive me for not answering your kind comments to my blog. My energy level is simply nil. My daughter Sarah is writing this for me. The result of my discomfort is that I now resemble a porcupine on drugs. In addition to my PICC line with two outlets which are normally occupied by the immune suppressor and the saline drip then I have two cannular through which no fewer than five anti-nausea drugs are sent to me 24/7 and anti-viral drugs and the other one is used for anti-viral drugs and paracetamol when my fever goes up which is often. Elsewhere my veins are punctured with little holes. The doctor who came to see me who’s head of the Symptom Management Team agreed with me that this treatment is ‘really rough’. So I fervently hope it will be worth it. I spend a lot of time gazing in to space. Particularly at the picture of Mount Everest with Tibetan prayer flags in the foreground which is directly opposite me. It brings back so many happy memories. Then I swivel my eyes to the left where I have my pictures of the mountains in Mallorca and a lovely photo of George and Sarah when we were on safari in Tanzania. Again, lots of happy memories. 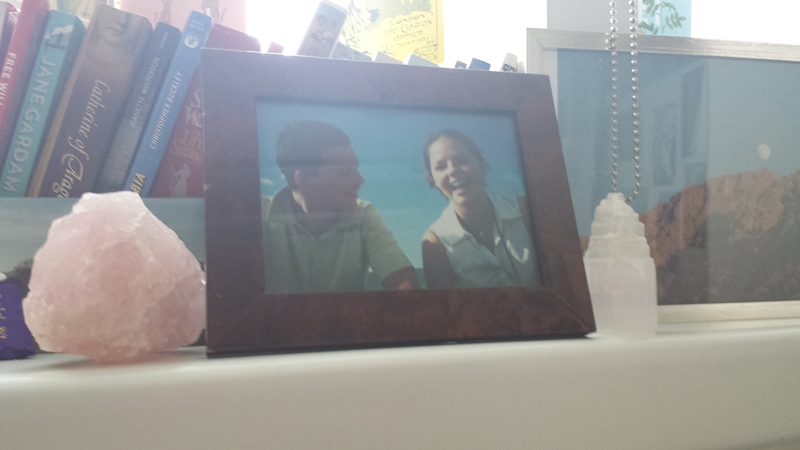 Next to the photo I’ve got my two crystals given to me by my French cousin, Caroline. The large pink one is meant to take away fear and the white one is meant to cure cancer. I have been mightily tempted over the last few days to put one in each hand and do a runner. And leave it to the crystals! Next > What A Night! Sue, I’m not going to kid you that this doesn’t get worse (though it might not). What I will say, is that you need to be stubborn, and patient and overwhelmingly optimistic and know that it will come to a successful outcome. I have no doubt, with your history, that you have all those qualities in bucket loads. Every patient has a different journey, a different story to tell, but tell it you must – because there is always someone out there who will take courage from what you’ve learned. Best wishes for your successful treatment. Russell. Horrible ordeal sounds like. Hope it starts to get more bearable soon. Are you listening to music, watching distracting tv? Thinking much about you, big hugs to you, Sarah George and Nick. Not good to hear all that buf i just think it is part of getting well! So you myst look at your dear photos and project the future images when you will docall the things you usef to do! I imagine how hard it is, or can’t even imagine but i know for sure you will soon get over it and you will enjoy life even more than you used to! I’ve been following your blogs intently and sending prayers and positive thoughts in your direction. You and your fabulous home in C’an Reus was a godsend to me at a time in my life when I needed positivity and support. I was in a committed relationship for about 10 years and had moved country to be with and build a life with my partner. When our plans didn’t work out, I despaired at how I could possibly live a fulfilling life on my own. One of my first challenges was how to holiday alone and have fun. I need not have worried – I headed for C’an Reus, a fabulous place I had holidayed with my partner – but it was the ideal place to create new memories- ones that continue to empower me 5 years on. Your home gave me strength. I pray that your temporary home – for medical purposes – gives you strength and I pray that you will make a strong recovery. I dream of returning to you hosting one of your immensely enjoyable Mallorcan evenings before too long. I was very touched by your email and thanks for writing. I am so pleasrd that Can Reus played an important part in your restoration and hope that we shall see you again there soon. There is little I can add to the above, except to agree with everybody else – and to let you know how much I admire and respect your extraordinary courage and humour. You are an inspiration to us all and I have no doubt that these qualities will see you through the worst. As Julian of Norwich said: “All shall be well, and all shall be well and all manner of things shall be well.” God bless! The Poet speaks true: the way is long and hard, but you’ll get there in the end — with or without Virgil’s help!